Pope Francis appointed two Boholano priests as bishops of Butuan in the CARAGA Region and Isabela, Basilan at 7 p.m. on Monday. The new Boholano bishops are Fr. Cosme Almedilla and Fr. Leo Dalmao, said the Catholic Bishops’ Conference of the Philippines (CBCP). Almadella, a clergy of the Diocese of Talibon, will succeed Bishop Juan de Dios Pueblos, who died in October, 2017, as bishop of the Diocese of Butuan. 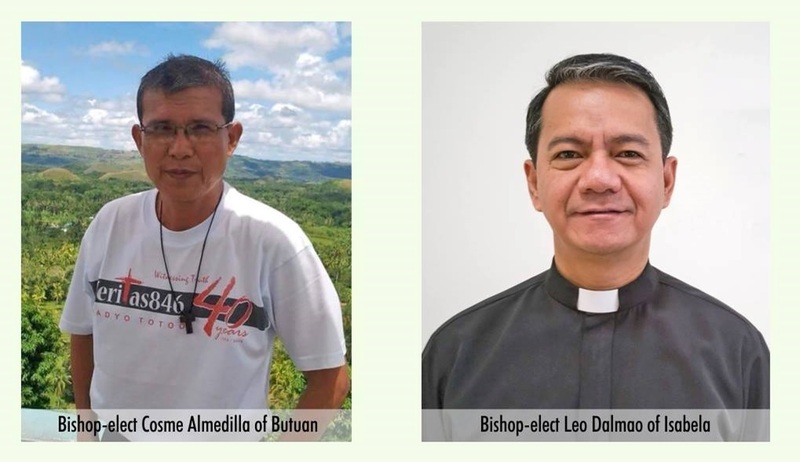 Dalmao, meanwhile, will take over the top post of the Prelature of Isabela in Basilan from Archbishop Martin Jumoad, who was appointed to lead the Archdiocese of Ozamiz in October 2016. Almadella, 60, was ordained a priest on Aug. 4, 1987. He has been serving as parish priest at the Holy Child Parish in Ubay, Bohol. Almadella was previously assigned as the spiritual director at the John XXII College Seminary, Director of the Holy Child Academy in Bohol, and chaplain at the Asian Hospital and Medical Center in Muntinlupa City. According to the CBCP, Dalmao is currently serving as Consultor and the Prefect of Formation at the Istituto Guiridico Claretiano in Rome, Italy. At 49, he will be the first Filipino Claretian to become bishop. He was born in Tagbilaran City and entered the Congregation in 1986, studying philosophy at Claret Formation Center, now known as St. Anthony Mary Claret College, the CBCP said.